Each of Shawmut’s three locations offers excellent service and maintenance from factory trained technicians. Shawmut provides its technicians with fully equipped service trucks, and all technicians are members of the International Union of Operating Engineers. 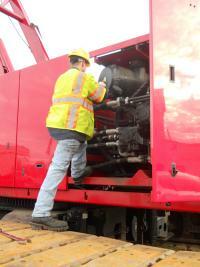 Shawmut Equipment takes pride in employing some of the country’s best service technicians. All of Shawmut’s technicians attend regular training at factory schools, have many years of repair and service experience and are trained specially on the equipment they service. We have state-of-the-art repair facilities and diagnostic equipment at each of our locations to troubleshoot a situation quickly, identify problems and offer solutions to enhance your equipment’s performance. Repairs are diagnosed correctly and completed on time, within budget. Shawmut Equipment maintains a fleet of service trucks, equipped with the latest repair and diagnostic tools to provide 24 hour on-site service for both repairs and routine maintenance. Shawmut Equipment can design a preventive maintenance program for your fleet to assure that we perform maintenance activities that meet your warranty coverage requirements. By performing routine maintenance, you will avoid unplanned downtime, unexpected breakdowns, and injuries. Please contact out Service Department at (800) 829-4161.